USES: This medication is used to relieve pain and discomfort of certain mouth, nose, and throat problems. It is a topical anesthetic (amide-type) that numbs the mucous membranes (skin) of the mouth, nose, and throat. HOW TO USE: This medication may be used as a spray by putting the solution into a special spray bottle (atomizer). It can also be applied directly to the affected area with a sterile applicator or swab. Discard applicator or swab after use. Do not swallow the medication unless directed to do so by your doctor. Do not drink water or any liquids after applying this medication to the mouth or throat and avoid eating any food for at least 1 hour. This medication will numb your tongue and affect swallowing. It is important not to eat or chew gum while your mouth is numb to prevent choking or biting your tongue. Do not increase your dose or use more often than prescribed without your doctor's approval. Inform your doctor if your condition persists or worsens. SIDE EFFECTS: Minor stinging, burning and tenderness of the mouth, nose, and throat may occur when this drug is applied to these areas. Dizziness, drowsiness, lightheadedness, vomiting, or sensations of heat, cold, or numbness may also occur. If any of these effects persist or worsen, notify your doctor or pharmacist promptly. Remember that your doctor has prescribed this medication because he or she has judged that the benefit to you is greater than the risk of side effects. Many people using this medication do not have serious side effects. Tell your doctor immediately if any of these highly unlikely but serious side effects occur: mental/mood changes, ringing in the ears, vision changes, slow or fast heartbeat, rapid breathing, fever, seizures. A serious allergic reaction to this drug is unlikely, but seek immediate medical attention if it occurs. Symptoms of a serious allergic reaction include: rash, itching/swelling (especially of the face/tongue/throat), severe dizziness, trouble breathing. This is not a complete list of possible side effects. If you notice other effects not listed above, contact your doctor or pharmacist. In the US - Call your doctor for medical advice about side effects. You may report side effects to FDA at 1-800-FDA-1088. In Canada - Call your doctor for medical advice about side effects. You may report side effects to Health Canada at 1-866-234-2345. 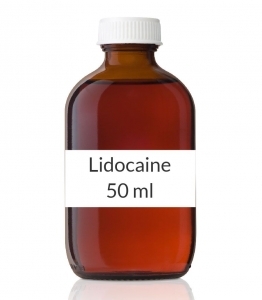 PRECAUTIONS: Before using lidocaine, tell your doctor or pharmacist if you are allergic to it; or to other local anesthetics such as bupivicaine or mepivacaine; or if you have other allergies. This product may contain inactive ingredients (such as PABA), which can cause allergic reactions or other problems. Talk to your pharmacist for more details. Before using this medication, tell your doctor or pharmacist your medical history, especially of: heart problems, any infections or open wounds where the drug is to be administered, severe liver disease. Caution is advised when using this drug in the elderly because they may be more sensitive its side effects. Caution is advised when using this drug in children because they may be more sensitive its side effects. Tell your doctor if you are pregnant before using this medication. This drug passes into breast milk. While there have been no reports of harm to nursing infants, consult your doctor before breast-feeding. DRUG INTERACTIONS: Your doctor or pharmacist may already be aware of any possible drug interactions and may be monitoring you for them. Do not start, stop, or change the dosage of any medicine before checking with them first. This drug should not be used with the following medications because very serious interactions may occur: arbutamine, dofetilide, disopyramide, halofantrine, pimozide. If you are currently using any of these medications, tell your doctor or pharmacist before starting lidocaine. Before using this medication, tell your doctor or pharmacist of all prescription and nonprescription/herbal products you may use, especially of: amprenavir/fosamprenavir, beta-blockers (e.g., propranolol, metoprolol), cimetidine, darunavir, succinylcholine. This document does not contain all possible interactions. Therefore, before using this product, tell your doctor or pharmacist of all the products you use. Keep a list of all your medications with you, and share the list with your doctor and pharmacist. OVERDOSE: If overdose is suspected, contact your local poison control center or emergency room immediately. US residents can call the US national poison hotline at 1-800-222-1222. Canadian residents should call their local poison control center directly. Symptoms of overdose may include: seizures, trouble breathing, irregular heartbeat, unconsciousness. STORAGE: Store at room temperature away from sunlight and moisture. Do not freeze. Do not store in the bathroom. Keep all medicines away from children and pets. Do not flush medications down the toilet or pour them into a drain unless instructed to do so. Properly discard this product when it is expired or no longer needed. Consult your pharmacist or local waste disposal company for more details about how to safely discard your product.